Central Florida linebacker Shaquem Griffin, who plays with one hand after his left hand was amputated when he was four years old, dazzled at the NFL combine. Griffin did 20 reps during the bench press with a prosthetic hand, then ran a 4.38 in the 40-yard dash, the fastest of any linebacker. Griffin received a late invitation to the combine and was considered a fringe prospect, but now may have elevated himself into the third or fourth round of the draft. 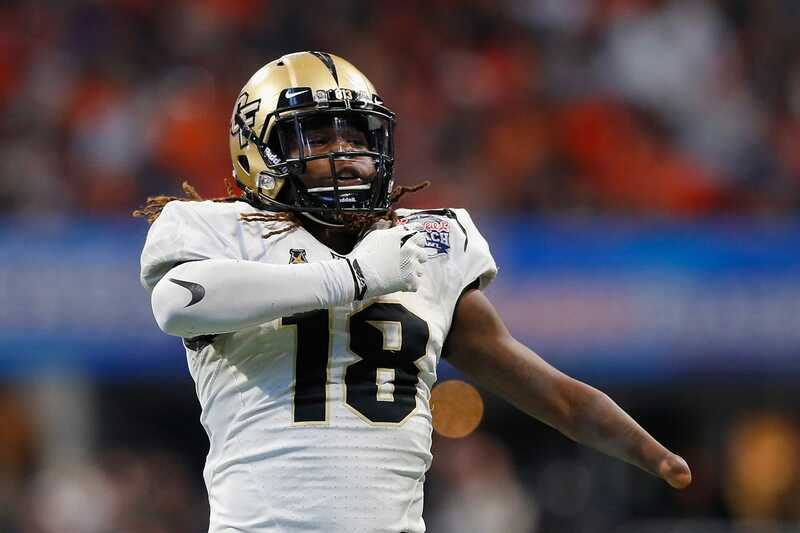 Central Florida linebacker Shaquem Griffin became the star of the NFL Draft combine over the weekend with a dazzling performance. Griffin, the 2016 American Athletic Conference defensive player of the year, initially wasn’t invited to the combine before receiving a late invitation. Adding to Griffin’s story is that he had to have his left hand amputated when he was four years old because of a congenital disease. Griffin has played one-handed his whole life and used a prosthetic hand gripped to the bar during the bench press, which is when he first turned heads. Griffin told reporters that his goal was six reps of 225 lb. He did 20 at the combine. Griffin told Sports Illustrated’s Peter King that when he first got fitted for the prosthetic hand, he struggled to lift with it, saying he could barely bench the 45 lb bar. But he kept working on it and moved up to doing 20 reps of 225 lb. Griffin continued to dazzle by running a 4.38 in the 40-yard dash, the fastest time of any linebacker since 2006, when ESPN began recording the times. Griffin’s time was the third-fastest of the combine, trailing only two wide receivers. Seattle Seahawks coach Pete Carroll’s reaction to Griffin’s time was revealing. Some of the biggest names in the NFL tweeted their thoughts about Griffin’s performance. If @Shaquemgriffin doesn’t get drafted in the first two days the system is broken. Productive and performed well at the combine. Played well against high level competition. Some in the NFL world think Griffin’s performance indicated how he could perform at the pro-level – relentlessly and with heart. According to King, New Orleans Saints head coach Sean Payton noted that some players will try to play through hand injuries during the season. Griffin, meanwhile, has played that his entire life and is accustomed to it, playing with high energy at every level. According to King, Griffin may have elevated himself from a sixth- or seventh-round pick to third- or fourth- with his performance. While some question the importance of combine tests, clearly Griffin is an example of how it can change a prospect’s outlook.